The ABF-260 has been specially developed for use in road traffic tunnels to form part of the public address/emergency sound system and has already been used in highly successful installations all around the world. The current ABF-260 is the second generation ABF. This second generation horn has a higher SPL capability and enhanced water ingress protection. The ABF’s low profile and its ability to produce high sound pressure levels with negligible distortion make it the perfect solution for low ceiling noisy environments like traffic tunnels. A single ABF is capable of covering large distances within a tunnel environment. For tunnels with a very small vehicle envelope, an ultra low profile version of the ABF is available. Designed for tunnels - The ABF-260 has not only been designed to deliver clear and intelligible messages but also to meet the demands of the tunnel environment. The primary purpose of any loudspeaker is to move air and create sound. Extreme care has been taken to ensure that the unit can cope with the rigours of tunnel cleaning, sprinkler and deluge systems whilst at the same time not compromising the performance of the loudspeaker. The ABF comprises of an impact resistant flare, which is manufactured using a fire-retardant polyamide (PA 6) with flammability specification according to UL94 with flame classification V0, a 2” exit (4” voice coil) high performance compression driver that can be tapped at 50 or 100 Watts and a 100 V impedance transformer. The exit or mouth of the flare is fitted with a stainless steel grill to prevent water from entering the flare during tunnel cleaning. This grill has been specially designed so that it does not affect the acoustical performance of the ABF-260. Easy to install and maintain – With ABF there are fewer installation points compared to conventional loudspeaker systems. To assist with installation an optional drilling template is available. Highly reliable systems – The cost of servicing equipment in tunnels is very high. For this reason Duran Audio uses high quality components and a thorough quality assurance system to ensure that the ABF is reliable throughout its lifetime. Meeting standards - The ABF-260 is manufactured at Duran Audio’s R&D and manufacturing facility located in Hungary. This facility is ISO 9001 certified. What makes the ABF unique? The patented Asymmetric Boundary Flare (ABF) geometry is based on the principle of using acoustical mirroring to obtain a flat coherent wave front. The ABF is designed to be mounted on the ceilings of road tunnels, the ceiling then acts as a waveguide; reducing lateral reflections and obtaining a coherent wave front. The image above is a cross-section view comparing the direct sound frequency response of an ABF to a Symmetric horn. As you can see the Symmetric horn suffers significantly from interference caused by the ceiling reflection. It can be clearly seen that the ABF does not suffer from this problem. This principle means that an ABF horn can provide a high power and high directivity whilst at the same time offering a wide frequency response and exceptional sensitivity. Generic horns and even symmetrical horns generally have poor directivity (they do not control the dispersion of the sound well and throw sound out in all directions) and suffer from a poor front to back ratio. Due to the patented ABF technology combined with the large size of the ABF horn we are able to provide a higher front to back ratio and greater directivity than other horn technologies. This benefits the ABF in two ways: (1) Energy from additional horns combines with minimum interference creating a coherent wave front that travels along the tunnel (2) Weak rear radiated energy causes minimum interference. This can be seen in the diagram as well as in the simulation video below. Public Address/Emergency sound systems in tunnels are part of an emergency system. Therefore they have to comply with strict standards and regulations. Most of these standards demand that the system is capable of achieving 0.5 STI with the maximum background noise. However, tunnels are very challenging spaces and 0.45 STI with maximum background noise present is a more realistic target. This 0.45 STI value is now specified in many national tunnel standards which in this respect deviate from EN/IEC standards. • Achieve an average of 0.45 STI. This must be predicted and measured with level dependant masking and with the specified background noise level. Background noise levels should be specified in octaves and include traffic noise as well as fan noise. • Are Independently verified. The system performance should be verified by an independent acoustic consultant. The accepted objective measure to quantify the quality of voice transmission is the Speech Transmission Index, STI. This is determined and described by the International Standard IEC60268-16:2011. The STI measurement has to take into account the Background Noise Levels (BNL) and Masking Effect. Tunnel Background Noise Levels are estimated to be 96 dB(A) sum of traffic noise and fan noise, considering 70km/h speed in the tunnel. These BNL may vary considerably from tunnel to tunnel. Due to the high BNL the PA/VA system has to output levels of 105 dB(A). Therefore there is a lot of penalisation in the STI figures due to the Masking Effect at high Sound Pressure Levels. 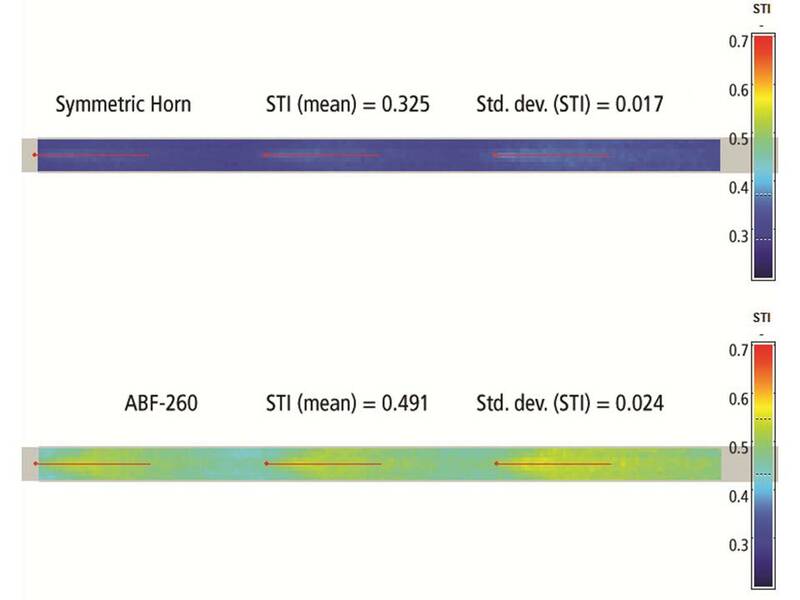 When we compare a symmetric horn (which is one of the better standard solutions that is available) with an ABF you can clearly see that there is a huge difference in performance when you model the system performance at 105 dBA with the background noise level present. 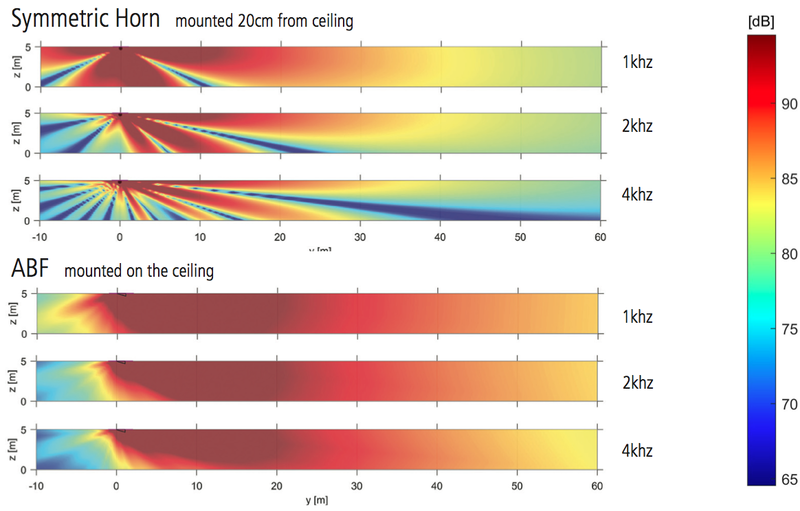 Is there acoustic modelling data available for the ABF-260? There are CLF (Common Loudspeaker Format) files available for use with both CATT-Acoustic™ and Odeon acoustic modelling software. A .GLL file is available for use with EASE (AURA module) acoustic modelling software. Please contact us directly for these files.